The Chaser (Chugyeogja) is directorial debut of Hong-jin Na who currently is one of the hottest directors in South Korea, and his latest movie The Yellow Sea is a sign that soon he will be on everyone's mind when discussing Korean cinema. 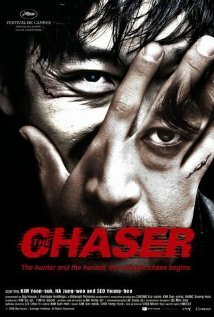 The Chaser is inspired by actual serial killer who was murdering in South Korea until 2004. As with Oldboy, Hollywood noticed how good it is and soon after release acquired rights for remake, so we can expect another take on this story sometime soon. Great acting, brutal violence, it's a must see for any serial killer movie fan. I keep wondering , does "he" know what he's doing or acting on impulse? Great one, and it had a surprising event near the end.